Ryanair Boosts Profits By 43% With "Significant Traffic Growth"
Over the period of 6 months shares in Ryanair have dropped by 7%. 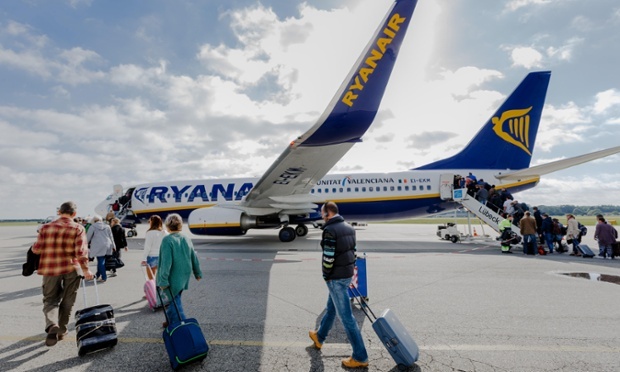 Ryanair (LON:RYA) on Monday released its full year update to investors and analysts in which it posted a 43% increase in full year profits. During the update the business said the group delivered “significant traffic and profit growth” as profits rose to €1,242m and traffic growing by 18% to 106m. Revenue in the period rose by 16% from €5654 million to €6536 million and basic earnings per share gained 48% to 0.93 per share from €0.63 per share. O’Leary said highlights from the year included average airfares being cut by 1% to €46.67, unit costs falling 6% and 5 year pay deals being agreed with all 84 pilot and cabin crew bases. The airline saw the arrival of 41 new B737 aircraft during the period allowing it to grow its low fare services to more primary airports and routes. Overall 7 new bases in Belfast, Berlin, Corfu, Gothenburg, Ibiza, Milan (Malpensa) and Santiago were added during the year whilst 100 new routes were put into operation. The fourth quarter was “adversely impacted” by 500 flight cancellations due to the Brussels terrorist attacks and French ATC flights. It also noted that recent strikes from Italian, Greek, Belgian and French ATC unions have caused a further 200+ cancellations which will negatively affect Q1 yields. Ryanair is to take delivery of 52 new B737 aircraft growing its fleet to 380 planes after handbacks by the end of the year. Looking forward the airline said it sees growth opportunities for Ryanair’s lower fares and AGB programme. On average it said it is has seen an increase of 2% in peak summer months than this time last year but at lower fares. The group expects a FY17 load factor of 93% similar to this year as traffic grows by 9% to 116 million during the period. Cautiously the company said it expects full year net profit to rise at a modest rate of 14% ranging between €1,375m and €1,425m dependent on the completion of summer bookings and winter yields. Receive Ryanair Holdings Plc News & Ratings Via Email - Enter your email address below to receive a concise daily summary of the latest news and analysts' ratings for Ryanair Holdings Plc with MarketBeat.com's FREE daily email newsletter.